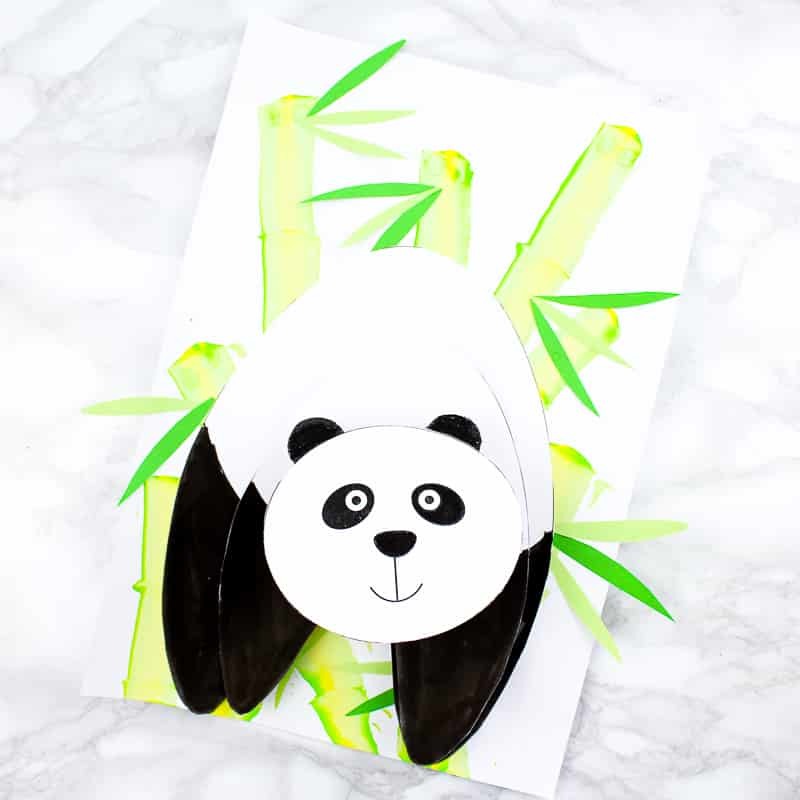 Inspired by our popular 3D Polar Bear, this Panda’s head will wobble and spring, with a personality that pops from the page. 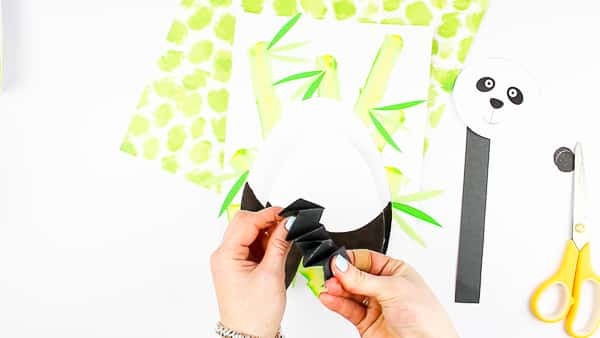 This interactive paper craft is super fun to make and comes with a printable template of simple shapes to encourage Arty Crafty Kids to practice their cutting and tracing skills. 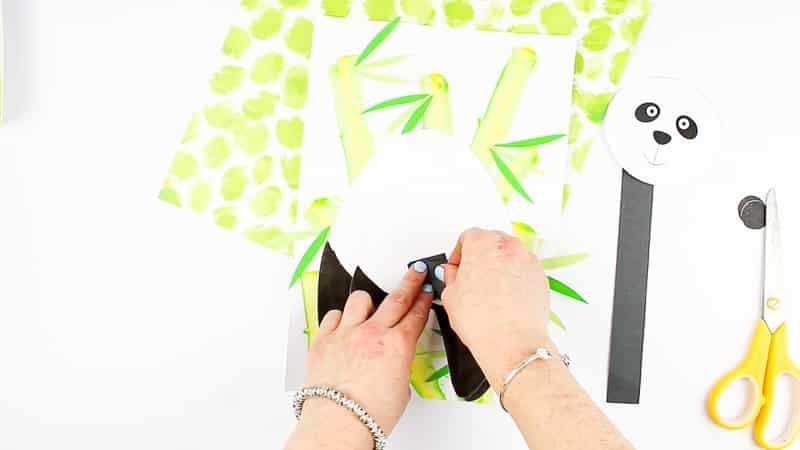 The interesting backdrop adds an arty element to the craft; introducing kids to the idea of painting without a paint brush to create different effects. 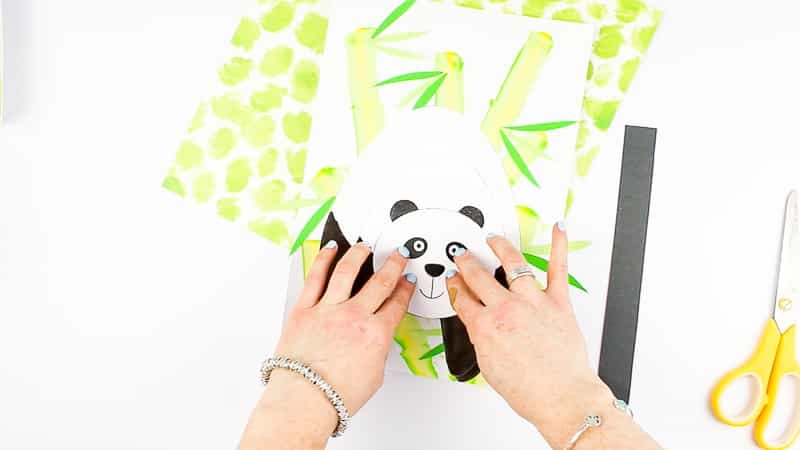 The Bobble Head Panda Template is exclusively available to Arty Crafty Kids Club members. 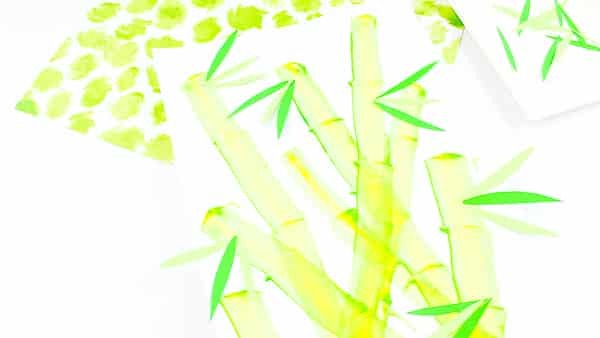 First, let’s create the bamboo backdrop! 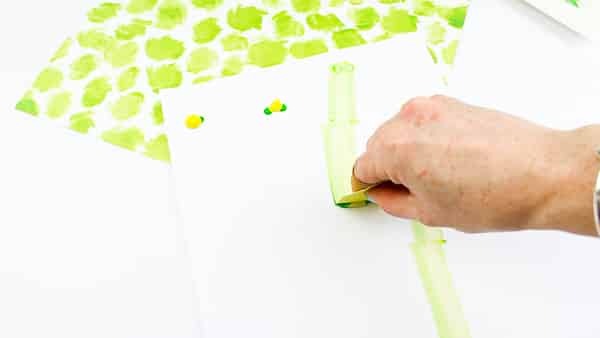 Using a sheet of white cardstock, add three small dots of paint (green, yellow, green) to the top of the page. Add three, maybe four spaced out separate paint sequences. 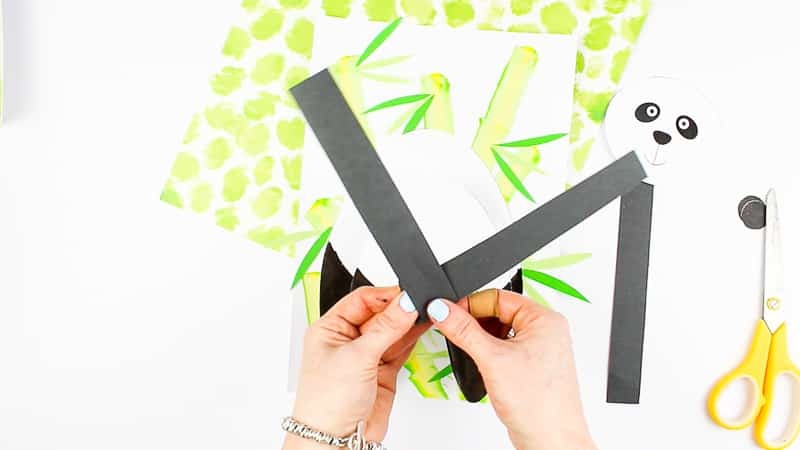 Take a piece of scrap cardboard and begin scraping the paint towards the bottom of the page. The paint could be scraped in one swift motion. 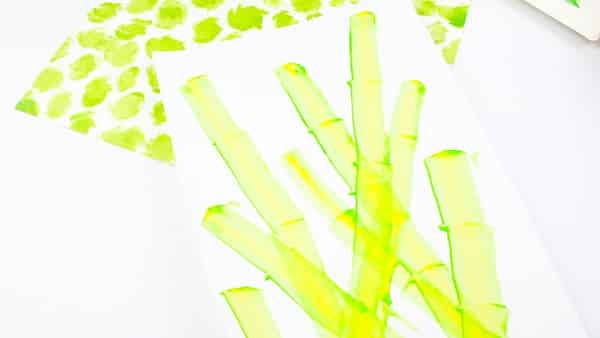 To create a bamboo effect, scrape the paint in the segments. 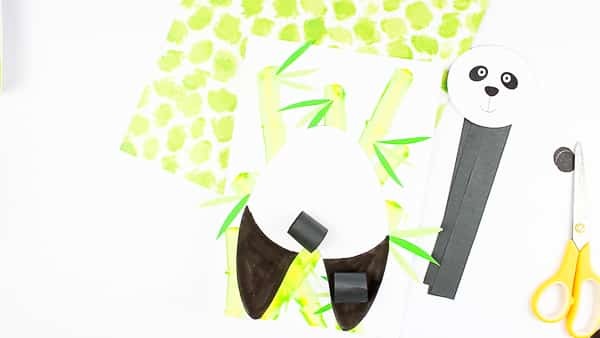 To create the segments, scrape the paint in a downward motion and stop at a desired length. At the stop point, without lifting the card, move it side to side to create a line. Once the line has been formed, continue scraping in downward motion. Continue this process until the paint has reached the bottom of the page. 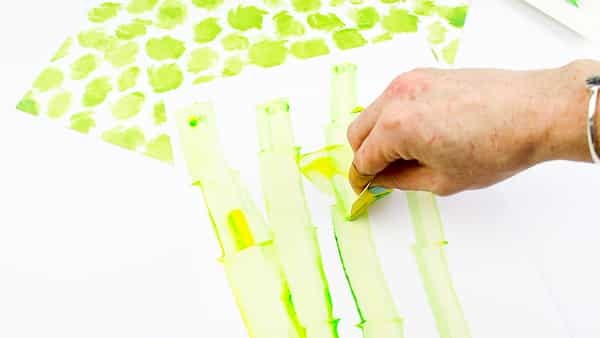 Once the paint has reached the bottom of the page, it should begin to look a little like bamboo. Add additional paint to create criss-crossing lines. 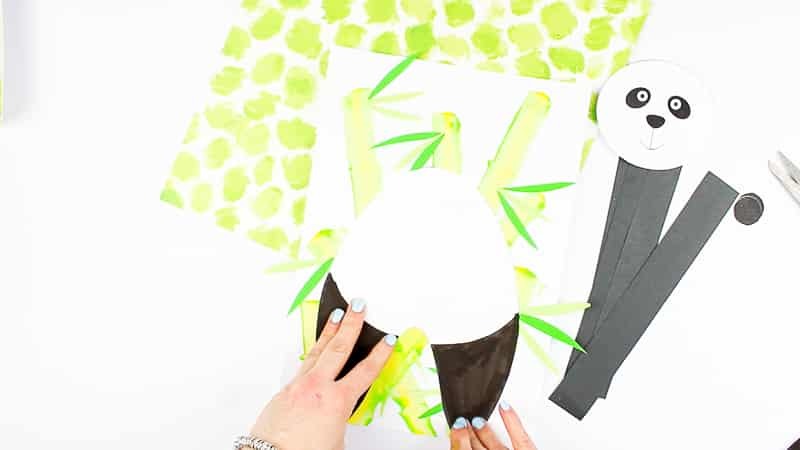 Using two shades of green paper, cut out lots of narrow leaf like shapes. 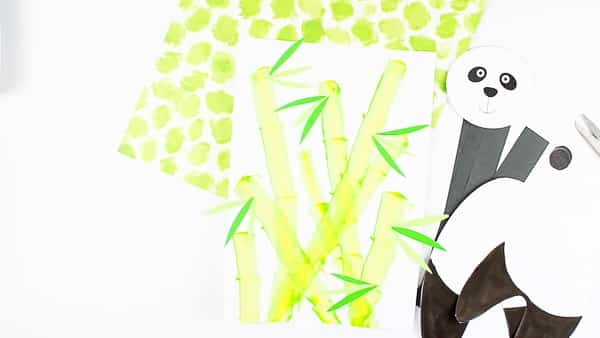 Stick the paper leaves to the lines of bamboo. This simple ‘bamboo effect’ process has been adapted from an excellent tutorial I stumbled across on Instagram. 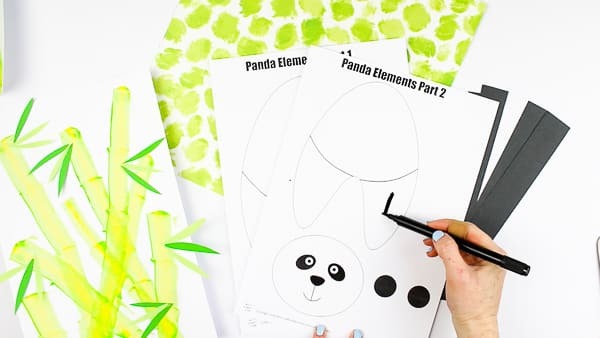 Download and print the Panda Template from the Arty Crafty Kids members area. Remember to use card less than 160 gsm in weight. Refer to your printer settings for further information. Using a black pen (or paint), colour in the lower leg areas. 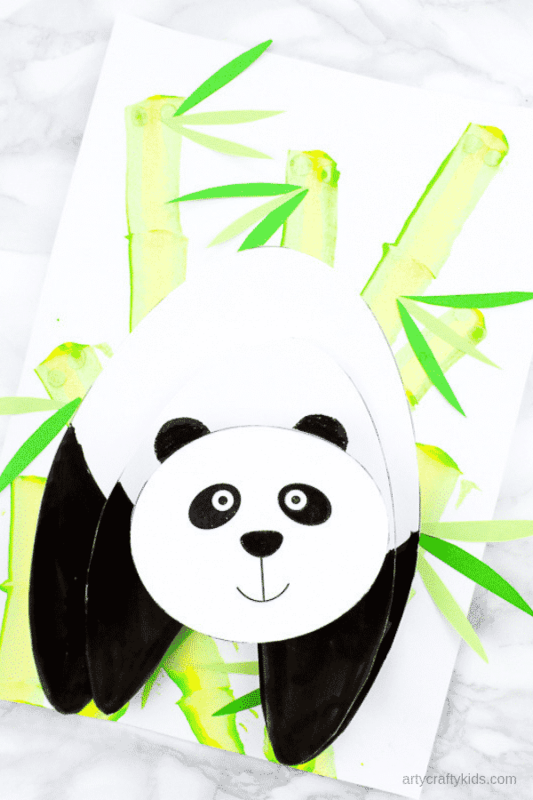 Cut out the Panda elements. Stick the large body element to the bamboo backdrop. 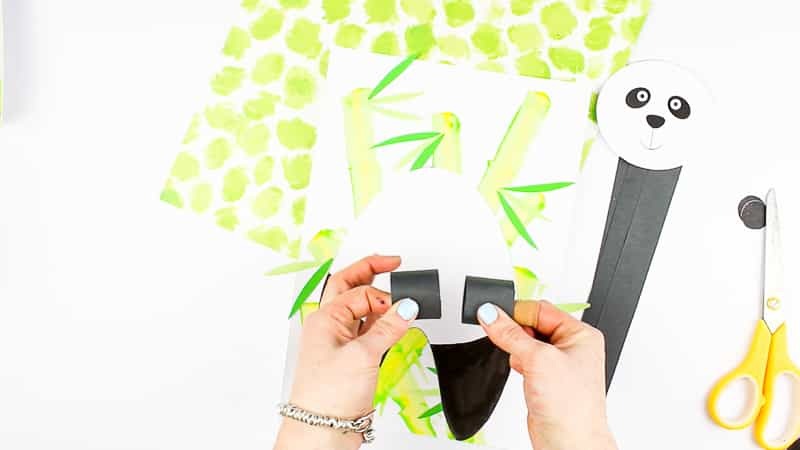 Using scissors or a paper cutter, cut out three even strips of black paper – ideally, the strips will be fairly wide and for length, I recommend cutting the paper from the shortest side of an A4 piece of paper. Cut one strip of black paper in half. Fold the two halves around to create two tubes. Position the paper tubes as shown above and secure with glue. Position the second body element on top of the paper tubes and secure with glue. Step 7: Creating the accordion fold. 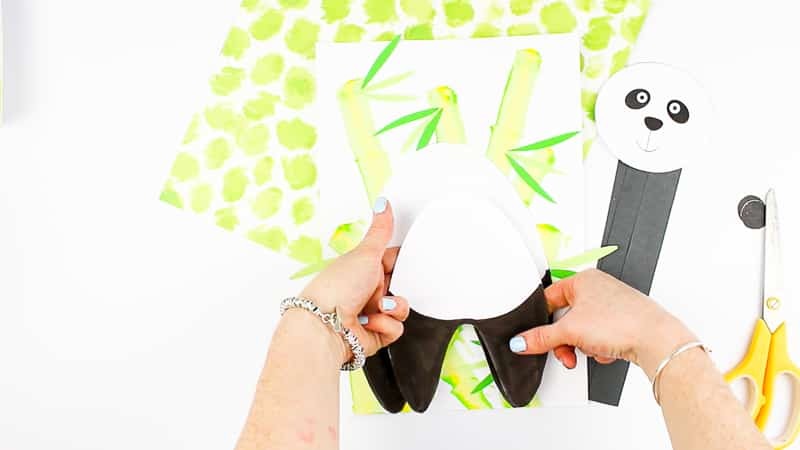 Attach one end of the accordion fold to the Panda’s body. 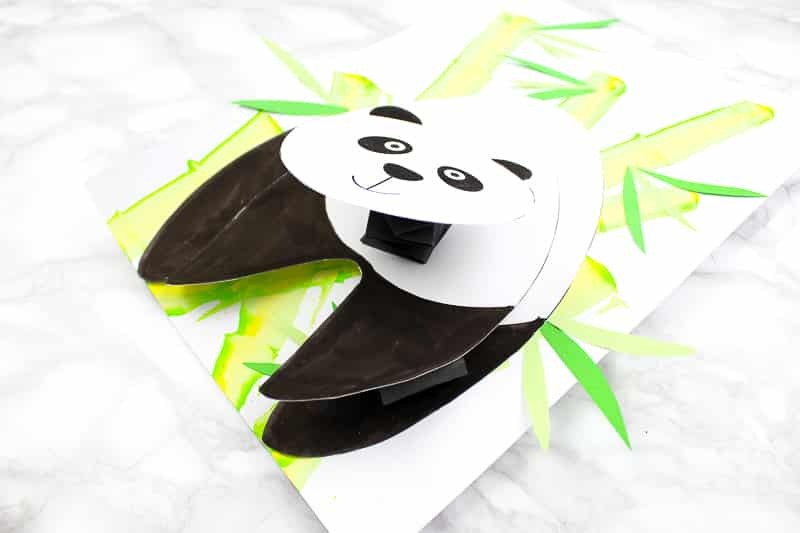 Glue the panda’s head on top of the accordion fold. Complete the panda by attaching its ears. The panda’s head will now bobble and spring when Arty Crafty Kids press down on the Panda’s head. 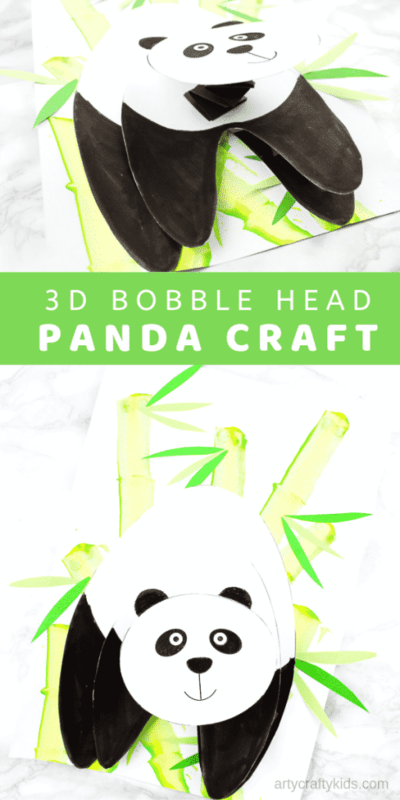 I hope your Arty Crafty Kids enjoy creating their 3D Bobble Head Panda’s!